This Is How Fast Does A 125cc Dirt Bike Go And Other Awesome Secrets. One of the bikes to make a big impression on teen (and some adult) dirt riders is the 125cc bike if its sales are anything to go by. But how fast does a 125cc dirt bike go and how else is a 125cc dirt bike engine unique? In this article, I will be answering the question “What is the top speed of a 125cc dirt bike?” and in general, how fast can a dirt bike go (125cc). How Fast Does A 125cc Dirt Bike Go In Mph? 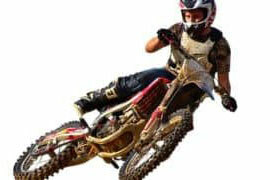 Well, a 125cc dirt bike top speed depends on various factors like the riders experience, specific brands, and terrain. For example, a 125cc dirt bike Apollo like the Apollo-DB-X18 (4 stroke, single cylinder) maxes out at 45 mph in perfect conditions. On the other hand, Coolster’s dirt bike 125cc zooms off at top speeds of between 40-45 mph. Mark you, this bike has again a single cylinder, 4-stroke engine. Cheap 125cc dirt bikes such as Taotao DB17 dirt bike will however go a bit slower and run at about 20-25 mph. But there are other varieties of TaoTao 125cc dirt bikes led by this 125cc dirt bike which near the likes of Coolster and Apollo’s by offering a maximum speed of 37 mph. The latter is still a 4-stroke, 1-cylinder so 4 strokes are quite common at this level. 4 Stroke Vs 2 stroke 125cc Dirt Bikes. As we know, the 4 stroke Vs 2 stroke dirt bike engine’s debate has been simmering for an eternity now and it rears its head again here. How Fast Does A 125 4 Stroke Dirt Bike Bike Go? All the dirt bikes I have mentioned above are 4-stroke. And it’s clear the speeds depend on the bike and features that each bike comes with. But on average, a 125 4 stroke dirt bike can go at a maximum of 45mph given an ideal riding environment for a number of our select models. There is of course a possibility of pushing this beyond the stated limit but it’s not every biker will have the skill to do this. In fact, and we will see this later, some of the expensive 125cc dirt bikes can hit a formidable speed of as much as 70+ mph. How Fast Does A 125cc 2 Stroke Dirt Bike Go? A 125 2 stroke dirt bike top speed will again swing from one model to the next depending on various factors. However, the speeds are not that far from their 4-stroke counterparts. For example, the Black Coolster dirt 125cc 2-stroke dirt bike goes slightly over 45 mph when at full speed. As I had hinted, the aforementioned Apollo 125cc dirt bike top speed of 45 mph is beaten hands down by most of the 125cc dirt bikes coming from the bigwig manufacturers such as Suzuki, Honda, and Yamaha, come of which register speeds of 70+ mph. Yamaha makes several top-rated 125cc dirt bikes. Here are the top 2. Yamaha yz125 dirt bike: Thus has the potential to go as fast as 70 mph. It has a 2-stroke engine delivering power and it’s quite light. Yamaha TTR125 dirt bike: The TTR125 dirt bike made its debut back in the year 2000 and comes with several entry-level capabilities including a 4-stroke, single-cylinder engine. This 125cc Dirt Bike Yamaha Top Speed averages 40 mph- this is closer to the models I highlighted earlier. Honda 125cc CRF125F Dirt Bike: With its 125cc air-cooled engine and four-speeds, the CRF125F can crank up to a top speed of 65 mph. 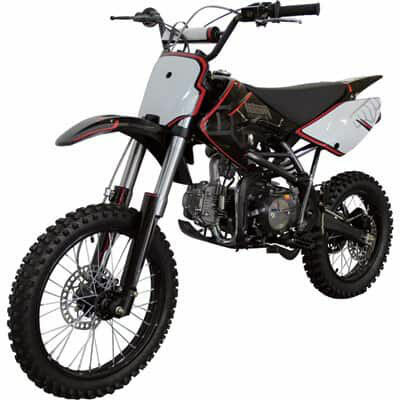 Honda 125cc CRF125FB: This 125cc dirt bike Honda top speed will be between 55-65mph, dependent on how good is the rider and Bike’s optimization. It’s another excellent performer. Kawasaki Z125 Pro dirt bike: This has been offering stiff competition to the Honda CRF125F and its doing pretty well. The resilient Kawasaki Z125 Pro delivers up to mid-60 mph for riders who know the art of maximizing its innate qualities. Kawasaki KX125 dirt-bike: For circuits with long straights and if the machine is perfectly geared, The KX125 can hit 60 – 70 mph even if the acceleration may not be as superb as on Kawasaki Z125 pro. Veterans could go beyond this provided the bike has the right tyres and outstanding aerodynamics. The latest KX has been, especially praised for its easier handling and consistent power. Suzuki dirt bikes are also big on fun thanks to their nimbleness. Most of their 125cc bikes are designed to super lightweight. Suzuki DR-Z125: This well-rounded off-road bike has at its heart a powerful 4-stroke, 124cc engine. Riding is easy and smooth and it guarantees an average top speed of about 69 mph. Suzuki RM125 Dirt Bike: This likely reaches around 60 mph with stock gearing. It also accelerates quite quickly while its construction ensures that it remains a pleasure to ride. If you are a fan of the Austrian bike maker KTM, you are in luck because the company has bikes with superior agility and engine power. The company pledges to fulfill the demands of young adrenalin seekers with its 125cc bikes. The king of the jungle here is the KTM 125 SX dirt bike, regarded as one of the most compact full-size dirt bikes. Its 1-cylinder, 2-stroke engine confidently delivers between 65-70 mph under the most favorable terrain. As usual, achieving this speed is dependent on gearing and a bevy of other factors. How 125 Dirt Bikes Compare to Pit Bikes. In pursuit of more adventure, some enthusiasts have taken to pit bike racing because of its similarity to motocross. So, how fast are pit bikes when pitted against dirt bikes? Well, a 125cc pit bike top speed will again depend on the brand and the technique of the rider. The engine’s highest speeds are themselves also quoted variously. To illustrate, the topmost speed for the SSR SR125 Pit Bike is between 30-35 MPH. The pit bike’s engine is still a 4-stroke, single cylinder. Going up, a 125cc Pit Bike from funky bikes hits 55MPH with a talented pit rider. The variations are as wild as in regular dirt bikes. What age is recommended for a 125cc dirt bike? Kids starting 12 years going up are okay with these bikes. That said, 125cc dirt bikes suit a universe of riders. It has sufficient power for a teen that seeks to test their skill beyond the norm. But it at the same time works for adults who are yet to master their thing and fear intimating dirt bikes. If you are 5’8″ tall, a seat height from 34 to 38″ should be adequate. Riders 5′ 6″ tall do well with bike seats between 34 to 37″ high while those about 5’4″ tall are likely to be comfortable with seats 33 to 36″ high. Lastly, 5’2″ tall dirt bikers fit well with 125cc dirt bikes whose seats range from 31 to 35″ high. What 125cc Dirt Bike Should I Get For My Teen? We have already mentioned about age and how a seat’s height vis-à-vis a rider’s height can affect his/her comfort and safe handling. The bike need to be rock solid. This means that a bike with a poor construction and a tendency to break down at every juncture is a big no. A 125cc model is more of a starter bike so it needs to be easy to engage. This encourages the rider to spend more time riding as well as incressing the fun. Teens want everything smooth at this level so they welcome a convenient electric starter over other systems. Enhanced suspension mean better control and a cozier time even when tackling a testing terrain. Comfortable levers and grips also improve control. Knobby tires fitted on equally great rims will provide better ground grip and longer life. So, again how fast is a 125cc bike? The answer is it depends on the brand and the riding technique. Various companies make 125cc bikes with different engine capacities starting at a maximum of about 20mph and going all the way up to 45+ mph. On the extreme end, the best one could hit 60-70mph as per the gearing. As for the best age, a 125 cc dirt bike suitability still depends on the dirt bike in addition to the rider’s skill and size. But it’s generally great for adults new to dirt bikes and ambitious teens looking for an extra thrill. 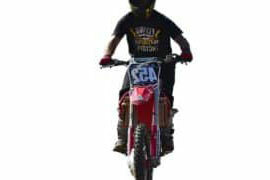 We have also seen that pit bikes are rated from45mph and can rise upward based on the brand.